We have dozens of these babies around Northern New Jersey right now. The weather in Northern New Jersey has been challenging, to say the least. With “weather” comes freezing, thawing, snow, ice, snowplows, salting and . . . well, you know all this already. Last night my daughter Tory had club volleyball practice. Since she isn’t allowed to drive herself to and from her many activities yet, I do. Yesterday I drove her to school on the icy snowy roads in our town and after that I drove her through the icy muck to and from her job at our local Y. My Audi A5 has been a champ in the icy, snowy conditions; what it doesn’t like is potholes, those yawning blacktop crevasses that appear like mushrooms during freeze/thaw cycles. Last night as I drove Tory to her club volleyball practice the Audi fell into a crevasse; I never saw it until we foundered in it! Immediately after impact, a light on the dashboard lit up like I had won at nickel slots; simultaneously, one of the on-board computers started cheeping. I had the sinking feeing that I had bought the big one: a flat tire. Closer to the gym than to home, I kept driving and the dashboard computer kept cheeping it’s distress. 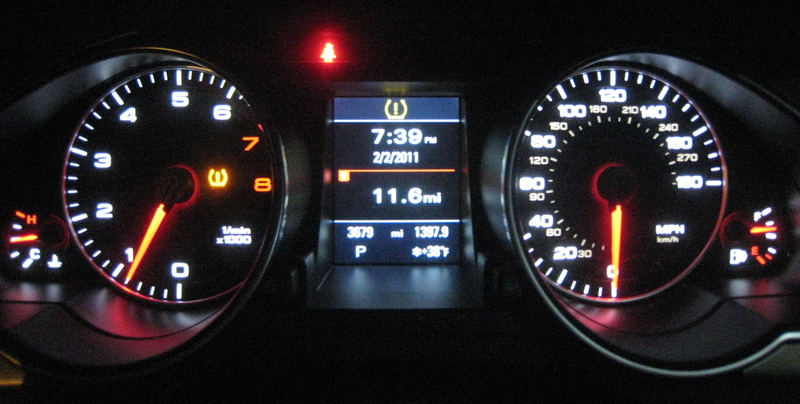 Look on the left gauge and see the 'lucky' horseshoe shape? It's not so lucky! By the time I pulled into the gym’s lot, I knew with certainty that my last nerve was frayed and I had a flat. “I’m done,” I yelled. Sure enough as Tory hopped out of the car and headed into practice I jumped out of the driver’s seat and saw it: the right front tire was flat. Since I’d had good luck using GEICO’s roadside assistance last summer when my Honda Pilot (may she rest in peace) had a flat, I immediately called GEICO. The phone rang and rang then an automated voice answered and instructed me to press 1 if this was a non-accident roadside emergency. I promptly pressed 1 and waited, and waited and waited; 5 minutes later and with no live person on the other end of the phone I hung up. Next I dialed the Audicare Hotline; the phone rang once and Zack answered. Zack took down my particulars, and within an hour ,a very competent young man and his sister replaced my flat tire with the “donut” spare and I was able to drive home. Willing to try again based on talking with Edwin, my salesman. 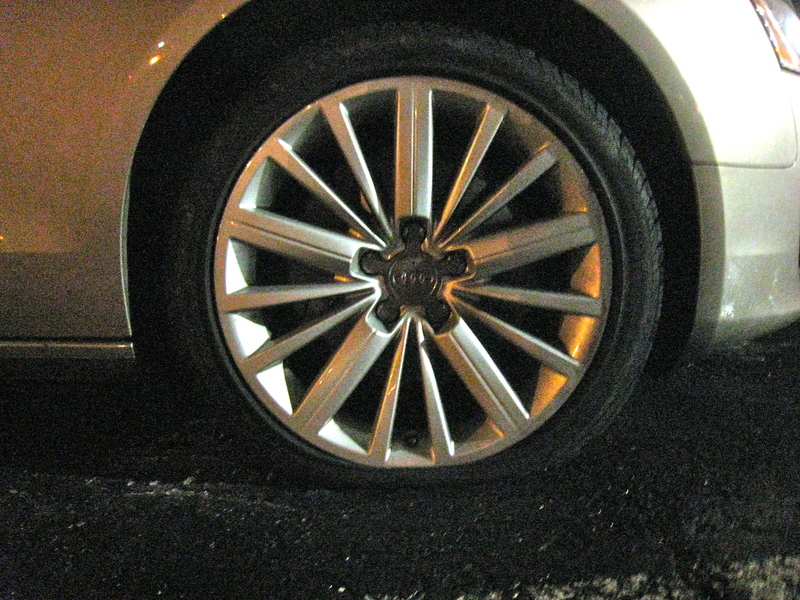 This morning I called Meadowlands Audi and made an appointment to get the tire replaced. Now, you may remember the aggravation and frustration I experienced when I got my Audi’s bumper repaired at that same facility a mere two months ago. I swore I was done with that repair facility. But at the end of the day Edwin, my salesman, pursued the trail of he said/she said and came back to talk with me. Long story short: I’m giving the Meadowlands customer service reps another shot at handling the communications end of the repair. . . because I learned how good the actual repair people are there. At noon today I headed East on Route 3 toward North Bergen where the repair facility is located. Almost immediately the Audi GPS lit up and told me an overturned tractor-trailer was blocking two lanes going east. And sure enough, in the short distance I could see a massive backup. Thinking quickly, I exited onto a nearby service road, u-turned on Route 17 and inched my way past the people offloading the wrecked tractor trailer. Score one for the Audi GPS and me. We were only 30 minutes late and I had called ahead to let them know so all was well. At 1 p.m. I released my Audi to the repair personnel. Shortly thereafter, I was told the tire was totaled and that the rim on the ‘donut’ is bent. Bent! 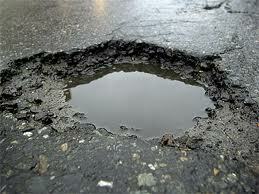 I swear that I didn’t hit a pothole driving the maybe 12 miles I had driven on it. By 2:15 p.m. I paid my bill for the replacement tire and headed for home. I’ve emailed Edwin and will be getting a quote on the tire/wheel insurance offered when I picked my new car up. With the amount of yawning potholes in my town alone that I could potentially fall into I figure paying for that insurance might be a good deal. N.J. road conditions: BAH HUMBUG! © Adventures of a Middle Age Mom 2009-2012.